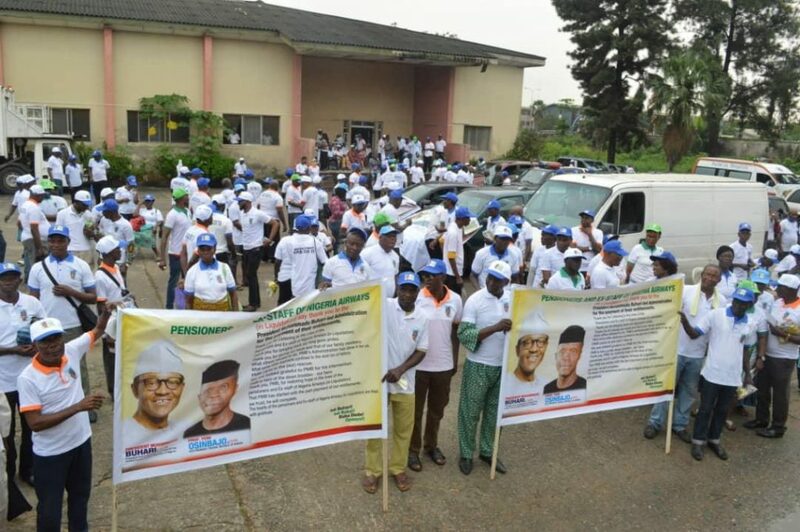 Hundreds of ex-workers, including pensioners of the defunct national carrier, Nigeria airways Ltd (NAL), on Friday trooped to the streets to rally support for the re-election of President Muhammadu Buhari, saying he alone had shown fatherly care among past presidents under who the workers suffered neglect for more than 14 years. The ex-staff were in December 2018, paid 50 percent of their entitlements after 800 pensioners had died from severe hardships under past regimes. They marched in hundreds from Skypower Aviation house at the GRA in Ikeja and traversed the Murtala Muhammed Airport, Ikeja, singing praises of the current administration and canvassing for the return of the regime. They resolved that they would support the President Muhammadu Buhari- led administration in the upcoming elections come what may, adding however that no member is being coerced to support the incumbent administration. The workers who questioned the morale behind those criticizing their actions, asked if they were in the same precarious situation for 14 years, if they would not support those who promised delivered them. Co-ordinator of the Ex-pensioners’ rally and former President of Aviation Union’s Grand Alliance (AUGA), Engineer Lookman Animashuan said in an interview that the rally was a reactionary support for the humanitarian gesture of this administration, stating that people can say whatever they want. He wondered where those criticisig their action were when they wallowed in neglect and poverty for 14 years. “Those people talking are wailers; they will never see anything good in anything. They should put themselves in our shoes and after 14 years if they haven’t been collecting salaries, if about 800 members and family members have died because of neglect they will not be talking the way they are talking. “We are celebrating President Muhammadu Buhari, we are happy for him, he has shown that he is a father of the nation, particularly to pensioners and ex- workers of Nigeria Airways and because for 14 years we were humiliated, we were neglected and he promised that if he is elected he will start to pay and he has started paying. He has approved 50% and the final set of people are collecting as we speak and also he has promised that in the next six months he will pay the balance. And 6 months is just around the corner and we believe him most especially as the money is in the budget”, he said. AUGA was joined by other unions in the industry like the Air Transport Senior Staff Services Association of Nigeria (ATSSSAN), National Union of Air Transport Employees (NUATE). This is just as the minister of Information; Alhaji Lai Mohammed has said that next-of-kins of deceased of ex-staff would also get their benefits after many long years of being in the doldrums. The Minister who was speaking at the rally, said other beneficiaries that have benefited from this government’s compassion included ex-Biafra police, ex- workers of the Nigerian Telecommunications (NITEL) as well as workers of the Ajala Delta Steel Company. “ It is noteworthy that since liquidation of Nigeria Airways, successive administrations have failed to settle the ex-staffers, leading to untold suffering and loss of human dignity by affected people. “For over 800 deceased ex-staff of Nigeria Airways, their next of kin will also receive the entitlements due to them”, he added.